I love these! 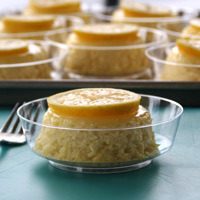 They are light and lemony, and easier to make than they may appear. If you like lemon, these are a must try! Heat oven to 325. Set out the ramekins. Using a paper towel, divide the butter among them. Generously and thouroughly coat the bottom and sides. Sprinkle the bottoms of each with 1/4 t sugar. 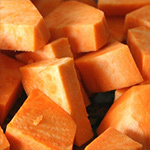 Place in a large pan. A roasting pan works well. Set aside. Zest the lemons. 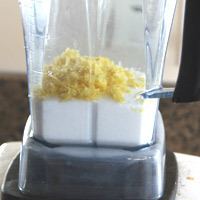 Measure the sugar into a blender or food processor. Add the zest. Blend well. Seperate the eggs. 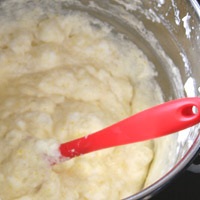 Place the whites in the bowl of an electric mixer. 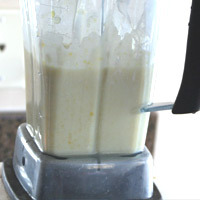 Place the yolks in the blender with the sugar mixture. 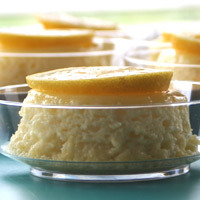 Lemon zest adds great flavor, but I don't like the pieces of it. Blending it breaks them up, evenly flavoring the entire dessert. 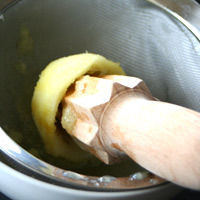 Using the whisk attachment, beat the whites on high until stiff peaks form. Set aside. Squeeze, strain and measure the lemon juice. Add to the sugar mixture in the blender. 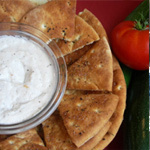 Also add the yogurt, flour and salt. Blend on low for a few seconds. Scrape down sides and any sugar that is stuck on the bottom. Blend on low until combined. Gently fold the mixture into the egg whites. 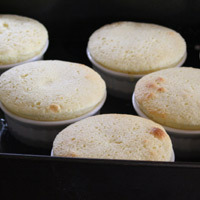 Divide among the prepared ramekins. 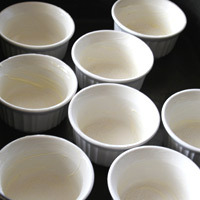 Pour hot water into the pan until the bottom half of the ramekins are submersed. The fresher the eggs, the quicker stiff peaks will form. Older eggs will still firm up, they just take longer. Don't overbeat or it turns clumpy and stinks. Throw it out if you do and start over. Bake 35 minutes until cakes spring back slightly. The tops should be slightly cracking. Don't overbake or you won't get the pudding layer. Immediately remove to a cooling rack. They will fall slightly as they cool, but should not sink in the middle. There is 5-10 minute window when the cakes should be removed from the ramekins. If you don't wait the five minutes, the cakes will fall apart when you invert them. 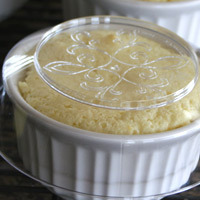 They are also harder to remove from the ramekin. If you wait more than 5-10 minutes they will continue to bake and you will lose some of the pudding layer. They will again be harder to remove. Let sit 5 minutes then run a knife around the top inch or so to loosen it. 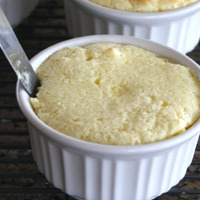 Place the individual serving bowl over the top of the ramekin. 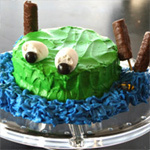 Invert and wait or gently tap the bottom until it releases the cake. Remove the ramekin. These are very delicate and difficult to transfer after removing them from the ramekin. It's best to place them directly on individual serving plates. 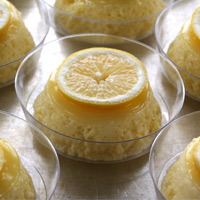 Garnish each with a lemon slice. Serve immediately, at room temperature, or chill and serve. Drizzle with berry syrup right before serving if desired. 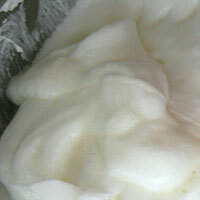 Egg whites- the egg whites should be beaten until stiff peaks form. Under-beaten- If they are under-beaten they won't hold up when folding the lemon mixture in. Overbeaten- If they are overbeaten they will seperate and taste bad. Under-cooking- the cakes will fall and be too wet if they are under-done. 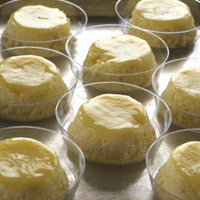 Removal Time- there is 5-10 minute window when the cakes should be removed from the ramekins. Too early- if you remove them before five minutes they will fall apart when you invert them. They are also harder to remove from the ramekin. 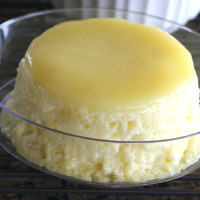 Too late- if you wait more than 10 minutes they will continue to bake and you will lose some of the pudding layer. They will again be harder to remove. 1. Heat oven to 325. 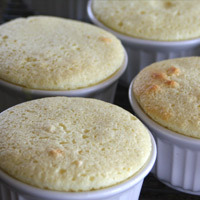 Set out the ramekins. Using a paper towel, divide the butter among them. Generously and thouroughly coat the bottom and sides. 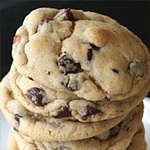 Sprinkle the bottoms of each with 1/2 t sugar. Place in a large pan. A roasting pan works well. Set aside. 2. Zest the lemons. 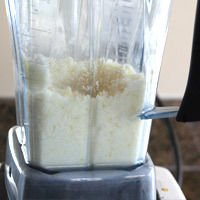 Measure the sugar into a blender or food processor. Add the zest. Blend well. 3. Seperate the eggs. Place the whites in the bowl of an electric mixer. 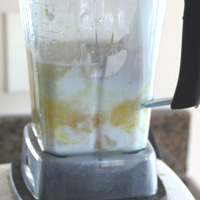 Place the yolks in the blender with the sugar mixture. 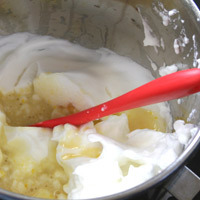 Using the whisk attachment, beat the whites on high until (2)stiff peaks form. Set aside. 4. Squeeze, strain and measure the lemon juice. Add to the sugar mixture in the blender. Also add the yogurt, flour and salt. Blend on low for a few seconds. Scrape down sides and any sugar that is stuck on the bottom. Blend on low until combined. 5. Gently fold the mixture into the egg whites. 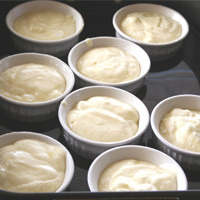 Divide among the prepared ramekins. 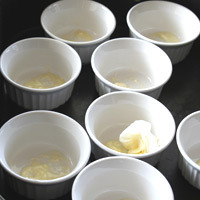 Pour hot water into the pan until the bottom half of the ramekins are submersed. Bake 35 minutes until cakes spring back slightly. The tops should be slightly cracking. Don't overbake or you won't get the pudding layer. Immediately remove to a cooling rack. They will fall slightly as they cool, but should not sink in the middle. Let (3)sit 5 minutes then run a knife around the top inch or so to loosen it. 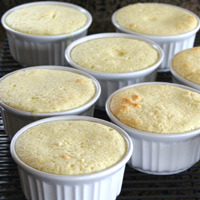 Place the (4)individual serving bowl over the top of the ramekin. Invert and wait or gently tap the bottom until it releases the cake. Remove the ramekin. Repeat with the remaining cakes. Garnish each with a lemon slice. Serve immediately, at room temperature, or chill and serve. Drizzle with berry syrup right before serving if desired. 1. 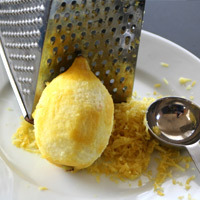 Lemon zest adds great flavor, but I don't like the pieces of it. Blending it breaks them up, evenly flavoring the entire dessert. 2. The fresher the eggs, the quicker stiff peaks will form. Older eggs will still firm up, they just take longer. Don't overbeat or it turns clumpy and stinks. Throw it out if you do and start over. 3. There is 5-10 minute window when the cakes should be removed from the ramekins. If you don't wait the five minutes, the cakes will fall apart when you invert them. They are also harder to remove from the ramekin. If you wait more than 5-10 minutes they will continue to bake and you will lose some of the pudding layer. They will again be harder to remove. 4. These are very delicate and difficult to transfer after removing them from the ramekin. It's best to place them directly on individual serving plates.